Nature gives us rest and relief in a modern world. In the world of design we use nature’s infinite raw forms and colors to soften our manufactured lines and shapes to create a truly welcoming space. Our global reach now allows us to draw on all the wonderful forms nature has to offer, from places as near as our gardens or as exotic as the heart of Africa. Our homes provide us a refuge from the stress and strain of the modern world—a place where we can rejuvenate, relax and refuel ourselves and families. We feel most at home when surrounded with meaning, sentiment, and beauty. Our space becomes a reflection of our lives and a way to share with others. Through our design and decor we express our interests, individuality, and communicate who we are. Global travel and an expanded understanding of a shrinking world provide us with more material than ever to express ourselves and share our ideas both through the familiar or the exotic. 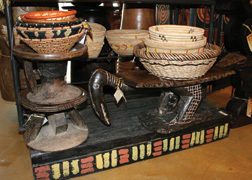 Mahogany stools from Ghana based on traditional styles “appeal to the customer who is looking for items not distinctly ethnic, but more comfortable and stylish”, according to Papa Awori , store manager for Swahili in Eugene, Oregon1. Swahili has served the African design and decor market for over a decade, practicing Fair Trade2 principles and community building along the way. Papa has seen the expansion of their market beyond the typical masks and earth-tone items pioneered by the adventurous Baby Boomers returning from vacations abroad. The younger buyers now are drawn to bolder patterns like Bogolon3 and Kuba4 cloth and have an interest in recycled goods, a mainstay of African crafts. Just as nature and animal forms inspire local crafts people to create Bogolon and Kuba cloth designs, consumers here are drawn to the ever-popular giraffe, elephant, and zebra for shapes, colors, and patterns. Designers also look to the riches of Africa, bringing in a zebra throw pillow or rug to balance out the static lines of a modern space. Whether it is floors, fabrics, or tabletop—Modern African Design is a perfect pairing of exotic and fresh. Decorative trends often begin with fabric fashions and exotic patterns in bright, new colors have been very active in clothing. These trends naturally fit into the home and influence the patterns and color in home accessories. For example, jewel-accented tabletop accessories made of natural materials and recycled glass add a tribal flair. Oversized zebra patterned rugs in new colors take on African themes and form the core of a new designer look. Two years ago Gango Editions began development of the new global and tribal inspired trend. Our artists started working with tribal patterns and animal patterns, combining them with abstract shapes and a contemporary color palette to create a whole new look. The results are excellent for the emerging trend of Modern African Design and timed perfectly for the marketplace. You see the results in MRN-60CS, 61CS and KME-77, 78 and many other images in our line. Cheryl Martin created Playing with Patterns I & II (MRN) using a palette of burnished silver, grassy green, white linen, and black. Martin illustrates a sense of the exotic in her use of a zebra skin pattern and flower while keeping it positively modern with her vibrant green, scroll, and silver. Nature also inspired the modern composition from Kime, Spirit’s Tapestry I & II (KME). This contemporary pair in natural, neutral tones depicts seed pods and leaves in contrast with abstract color blocks and circular elements at home in a modern space. 2 Fair Trade is a global movement advocating the payment of a fair price for goods thereby supporting local communities and preservation of environmental standards in the production of those goods. 3 Bogolon represents one of the mud cloth crafts and is know for its distinctive high-contrast patterns most commonly in black and white or brown and red. 4 Kuba cloth is a natural fabric made from raffia and bark often covered with distinctive patterns making it suitable for wall or table covers. Lesley Riva. “Organic Comfort.” Color Style 2008: pp.33-39. “Global Bazaar.” art.com catalog Fall, 2008: pp.22-23. “Shape Shifters.” west elm catalog July, 2008: pp.14-15. Christine Lennon. “Rhapsody in Gray.” Elle Decor Jan/Feb 2008: pp.96-97.